A century after the club’s foundation by a group of Italian immigrants in São Paulo, 2014 was meant to be a year of celebration for Palmeiras. However, thanks to a string of woeful executive decisions, their centennial turned out to be their annus horribilis, with Verdão fans left desperate to ring in the New Year as soon as possible. With their return to Brazil’s first division, the impending inauguration of their gorgeous new stadium Allianz Parque and the small matter of the club’s centenary celebrations, Palmeiras supporters demanded the board spare no expense and think big for the 2014 season. Initially, it seemed those in charge would oblige. Prestigious managerial candidates were interviewed and potential multi-million signings were floated, but club president Paulo Nobre’s obsession for austerity spoke louder. The quality reinforcements did not come, Palmeiras instead brought in aging world champion centre-back Lúcio on a free transfer (out of action for six months after being dropped by rivals São Paulo) and loaned Uruguayan defender Mauricio Victorino (on the sidelines for over a year with a heel injury) and midfielder Bruno César, who arrived from Saudi Arabia comically overweight. Jobbing head coach Gilson Kleina, who led the team to the second division title in 2013, was kept on, although it was made abundantly clear he was not their first choice and would walk the plank should results falter. The nightmare began with the São Paulo state championship: Palmeiras progressed from the first stage without any major surprises, but in their quarter-final match against minnows Ituano, they were beaten 1-0 and eliminated in front of their own fans. Kleina kept his job, but would receive his inevitable marching orders two months later, after only three matches of the Brazilian championship campaign. As if that was not sufficiently suicidal, Paulo Nobre then pulled off his most ambitious (and under the circumstances, short-sighted) move of a disastrous year and brought in Argentinian coach Ricardo Gareca to replace Kleina. Intelligent and forward-thinking, Gareca came highly recommended after some great years in his homeland with Vélez Sarsfield, but when thrown into the hectic environment that is the Palmeiras training ground, with the league season already well underway, he was destined to fail. Gareca’s Palmeiras showed some promising signs, their midfield looked more organised than it had been in a long time, but a leaky defence, lack of mental toughness and a complete inability to hold onto results saw them plummet to the lower half of the table. There was also reports that some members of the squad were less than happy about playing under an Argentinian manager. Foreign coaches are almost unheard of in Brazilian football and Ricardo Gareca’s scandalously brief stint in São Paulo will do nothing to help that. Granted, the universal preference for home-grown coaches in Brazil is not a matter of prejudice or intolerance, there are practical motives behind it. In general, Brazilian players respond best to coaches who are able to relate to and mentor them. The harsh reality is that many footballers in Brazil come from poorer backgrounds and may have had to leave their family at an early age. In these cases, the football coach fills the role of a father figure, something which cannot be achieved across a language barrier. The Argentinian was given a grand total of nine league matches over the space of six weeks before getting the sack, this coming after the club had spent an approximated R$ 30 million (around £7 million) to bring in four Argentinian players, Fernando Tóbio, Pablo Mouche, Agustín Allione and Jonathan Cristaldo on Gareca’s request. Trying to salvage something from an already disappointing centenary, Paulo Nobre rushed to appoint Gareca’s replacement, announcing Dorival Júnior, the bespectacled former Palmeiras midfielder fresh from a string of managerial failures at Flamengo, Vasco and Fluminense, as the man tasked with keeping the Verdão in the first division. Thanks to some naïve tactical choices, bad luck with injuries, his reluctance to play his four unhappy Argentinians and a crippling mental inferiority that spread throughout the entire squad, Dorival very nearly commanded Palmeiras to their third relegation in the 21st century. After some embarrassing results (a 6-0 defeat to Goiás, a 2-0 defeat at home to Atlético Mineiro’s B team and losing 2-0 to Sport Recife in the inaugural game at the stunning Allianz Parque), Palmeiras went into the last match of the season needing (at the very least) a point at home against Atlético Paranaense to avoid the drop. Their opponents had no stake in the result and fielded a reserve side, but Palmeiras coughed and spluttered to a 1-1 draw with the help of a dubious first-half penalty kick. The Verdão’s salvation came when news filtered through that Santos (traditionally one of Palmeiras’ rivals) had scored a last-minute winner to relegate north-eastern club Vitória. The club ended the division in 16th place with 20 losses and 40 points. Since the Brazilian championship made the switch to the 38-game season, no club had ever avoided relegation with 40 points. As it was when they won the second division last year, when their place in the first division was confirmed for 2015, there was no celebration from Palmeiras fans, with the team booed off the field accompanied by chants of “time sem vergonha!”, literally “shameless team”. 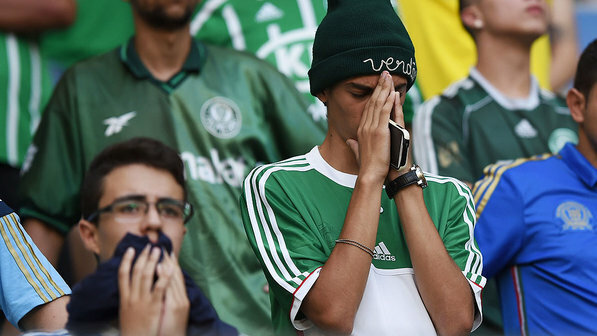 Palmeiras’ woeful performance in 2014, amid centennial celebrations, is another dent in the reputation of one of Brazil’s proudest football clubs. In the words of Brazilian journalist Mauricio Savarese, despite remaining in the first division, Palmeiras were relegated in 2014. Next year could well be the most crucial in Palmeiras’ 100-year history. Another relegation fight (or worse, another relegation) could see them reduced to yo-yo club status, and at a time when the country’s better-run big clubs (Cruzeiro, Corinthians, Atlético Mineiro, São Paulo) are threatening to distance themselves from the rest in a way Brazilian football has never seen before, such a step down could create an insurmountable gap between Palmeiras and Brazil’s elite. Rarely in the world of football are us fans treated to so many wonderful matches in the space of a single week. From Marcelo Bielsa’s superb Athletic Bilbao side and their spectacularly dogged display in Manchester, beating United 3×2 in Old Trafford, to the epic 4×4 draw between Godoy Cruz and Atlético Nacional in the Copa Libertadores, a classic tussle between attacker and counter-attacker. Even more rewarding however, were two virtuoso performances from two of the world’s best forwards, almost singlehandedly leading their clubs to victory. First of all, the undisputed best player on the planet, Lionel Messi and his record-breaking five goals in Barcelona’s 7×1 win over Bayer Leverkusen in the Champions League. The world looked on as Messi took apart the Leverkusen defence time and time again, before some of the game’s biggest personalities indulged in panegyrics over the 24 year-old, speculating over whether he really is the best of all time.